Now that the 2018 NFL Draft has come and gone, we can finally start looking forward to the actual 2018 season. The Dallas Cowboys finished off their 2017 campaign rather disappointingly, leading most fans to believe this is a do-or-die year for many people within the organization. While things may seem dire to some, and the Cowboys certainly have their roster holes, I do believe there are reasons to remain optimistic about how good this team can be in 2018. So, why not list four of said reasons? By using their second round pick on offensive lineman Connor Williams the Cowboys made a statement: it's time to get back to what they do. Too often last season this running game didn't look like we all know it can, and whether it was due to injury or suspension, those problems are hopefully behind them. The Cowboys will get their All-World running back Ezekiel Elliott for all 16 games (barring injury), and post arguably the best group of five offensive linemen in the entire league. While there are questions about the Cowboys' receiving corps and tight end group, there should be no doubt what the identity of this team will be. And that identity in itself is cause for optimism. Last offseason the Cowboys front office made changes in their secondary that many doubted, but one year in they are looking like forward-thinking geniuses because of those moves. Allowing veteran cornerbacks Brandon Carr and Morris Claiborne, as well as safeties JJ Wilcox and Barry Church, to walk in free agency was step one in revamping and rebuilding the Cowboys defense. Now, as rookies Chidobe Awuzie, Jourdan Lewis, and Xavier Woods enter year two the Cowboys should see more tangible success on the field. All three had successful rookie seasons, but with extra experience and comfortability they should be improved in 2018. Former Seattle Seahawks defensive coordinator Kris Richard will have his hands all over this secondary, and we should be excited about what they'll look like going forward. Much of Cowboys Nation is down on Dak Prescott after a shaky end to the 2017 season, but I believe we should be optimistic about his development heading into year 3. Prescott did things his rookie season that we have rarely ever seen, leading the Cowboys to a 13-3 record, a division crown, and going toe-to-toe with Aaron Rodgers in the playoffs. Now, Prescott gets his running back for all 16 games and an improved offensive line in front of him. Dallas has also added receivers that will hopefully better fit Prescott's skill set in Michael Gallup and Allen Hurns. We all saw what Dak looks like when things around him are clean, and they should be as clean as ever in 2018. Last but certainly not least, we should all be excited about what this Cowboys pass rush can be. 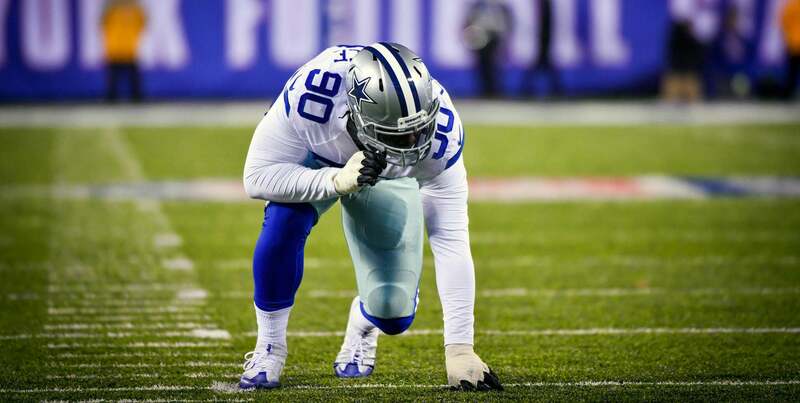 Defensive end DeMarcus Lawrence returns after his career year, and now playing under the franchise tag, he still has something to prove. Lawrence was on another level in 2017, and as long as he remains healthy, he should be incredibly productive this year. David Irving has begun to come along as a downright beast, aiding this pass rush from the interior. Hopefully Taco Charlton will take another step forward and continue to add to his pass rushing repertoire as well. And, of course, there is still the hope that Randy Gregory can return and be the explosive edge rusher the team is still looking for. If all goes right, this pass rush has the chance to be among the league's best. Bottom Line: Are the Cowboys Better or Worse for 2018?